More at “An actual rose bush plays ‘Every Rose Has Its Thorn’“; and more of Ridge’s remarkable work at the creator’s link at the Vimeo page above and on his Soundcloud page. 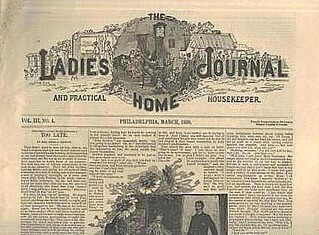 As we drop the needle, we might recall that it was on this date in 1883 that Ladies Home Journal was first published. Born of a a popular double-page supplement in the American magazine Tribune and Farmer titled Women at Home, it quickly became the most popular magazine of its type, and in 1903 became the first American magazine to reach 1 million subscribers. One of “The Seven Sisters”– publications aimed at women: the Journal, plus Better Homes and Gardens, Family Circle, Good Housekeeping, McCall’s, Redbook and Woman’s Day— the Journal led the pack in circulation until 1963 (when it fell behind McCall’s). Since 2014 its emphasis has been on the web; it has been available in print on newsstands only as a quarterly.